“Sporty Maths” is a Year 8 Elective where students explore maths concepts centred around the theme of sport. where the Xbox Kinect was used and students played the “Kinect Sports” game. Students took turns to participate in the track and field events. Times and distances were recorded and shared on an Excel Spreadsheet, then the data was analysed. Mr B, for his assistance in organising the session. 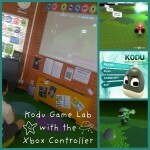 In our previous post, we explained how we have been testing Stephen Howell’s amazing Kinect2Scratch program. In this movie, one of our students tests the Kinect2Scratch Music game followed by Space Invaders. In our original test of the Space Invaders game, we were unable to get the shooting action working by raising our arms. However, after a quick tweet to Stephen Howell, he very kindly published some additions that we were able to add to Scratch in order to get the full functionality. He also very kindly added a new game, Kinect2Scratch Music, for us to test. As I set up my computer for the students to test this game, even I had no idea what awaited us! It was great to share in the excitement with the students! As part of our Inside the Game theme this term, we are encouraging students to share games that they have created. One of our Year 7 students, Daniel, was interviewed recently about a game he has created using the Warcraft Editor. Students have had the opporunity to play Daniel’s multiplayer game (that is yet to be officially named) and I was both fascintated and amazed to see the intricate programming involved in his project. Congratulations Daniel and thanks so much for sharing your exciting work with us!